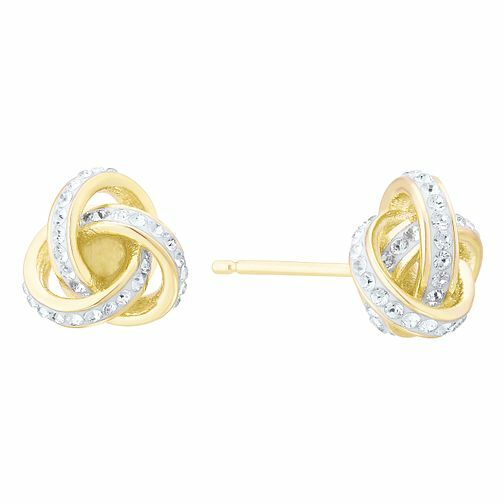 This set of gorgeous knot design stud earrings from Evoke is crafted from sleek sterling silver plated with gold. With a classic design, these elegant earrings are set with shimmering Swarovski crystal elements for a splash of sparkle. Evoke jewellery brings elegance, glamour and style to mind. Classic designs to compliment all occasions. Evoke Silver Gold Plated Crystal Knot Stud Earrings is rated 5.0 out of 5 by 2. Rated 5 out of 5 by Anonymous from Perfect size, very pretty. I'm not usually one for stud earrings, but glad i purchased these. Nice quality, a good size and they catch the light beautifully. Would make a lovely present 5/5 Loved them. Rated 5 out of 5 by Anonymous from Beautiful I bought this for my sisters 16th and she loved them.